This article is about the Korean food item. For other uses, see Ban Chan. Banchan (/ˈbɑːnˌtʃɑːn/, from Korean: 반찬; 飯饌; banchan [pan.tɕʰan]) or bansang is a collective name for small side dishes served along with cooked rice in Korean cuisine. As the Korean language does not distinguish between singular and plural grammatically, the word is used for both one such dish or all of them combined. The basic table setting for a meal called bansang (반상) usually consists of bap (밥, cooked rice), guk or tang (soup), gochujang or ganjang, jjigae, and kimchi. According to the number of banchan added, the table setting is called 3 cheop (삼첩), 5 cheop (오첩), 7 cheop (칠첩), 9 cheop (구첩), 12 cheop (십이첩) bansang, with the 12 cheop used in Korean royal cuisine. Banchan is thought to be a result of Buddhist influence at around the mid-Three Kingdoms period and the subsequent proscription against eating meat by the monarchies of these kingdoms. Thus, with the ban on meat-containing dishes, vegetable-based dishes rose in prominence and became the centrepoint of Korean cuisine; court kitchens developed various methods for cooking, preparing and presenting these dishes, while less-affluent commoners produced smaller, simpler arrays of these vegetable-based dishes. Although the Mongol invasions of Korea ended the ban on meat-containing dishes, as well as meat offerings for rituals such as jesa, approximately six centuries of vegetable-based cuisine in the form of banchan had imprinted itself into Korean cuisine. Kimchi is fermented vegetables, usually baechu (Napa cabbage), seasoned with chili peppers and salt. This is the essential banchan of a standard Korean meal. Some Koreans do not consider a meal complete without kimchi. Kimchi can be made with other vegetables as well, including scallions, gat (갓), and radish (무; mu). Dongchimi 동치미 Various vegetables in white brine. 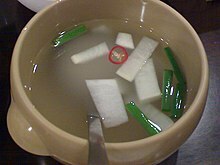 Nabak kimchi and dongchimi are referred to as mul kimchi (물김치), literally "water kimchi." Geotjeori 겉절이 Freshly made kimchi to be eaten crisp without fermenting. Usually made with baechu and lettuce. Chonggak kimchi 총각김치 Whole mu with chili pepper seasoning. It is made with dallangmu, about the same size as sausages. Yeolmu-kimchi 열무김치 Thin and small young summer radish kimchi, which can be prepared either with or without fermented jeotgal. Pa kimchi 파김치 Hot and salty scallion kimchi, seasoned with lots of myeolchijeot, the Korean version of salted anchovies. Gat kimchi 갓김치 Indian mustard leaf kimchi with a large amount of red pepper powder and the unique bitter taste and aroma. Strong myeolchijeot and glutinous rice paste are added to reduce the hot and bitter taste. Namul (나물) refers to steamed, marinated, or stir-fried vegetables usually seasoned with sesame oil, salt, vinegar, minced garlic, chopped green onions, dried chili peppers, and soy sauce. Kongnamul 콩나물 Cold boiled bean sprouts with sesame oil. Sigeumchi namul 시금치나물 Lightly parboiled spinach dressed with sesame oil, garlic, and soy sauce. Miyeok muchim 미역무침 Miyeok (wakame, a seaweed) with sweet vinegar and salt. Musaengchae/Muchae 무생채/무채 Long julienned white radish in a sweet vinegar sauce, sometimes with ground dried chili peppers. Gosari namul 고사리나물 Prepared fern shoots that have been stir-fried. Chwinamul 취나물 Stir-fried and seasoned aster scaber. Bireum namul 비름나물 Parboiled and seasoned amaranthus. Naengi namul 냉이나물 Parboiled and seasoned shepherd's purse. Dolnamul 돌나물 Raw Sedum with pepper sauce dressing. Gogumasun namul 고구마순나물 Boiled/seasoned sweet potato shoots. Gaji namul 가지나물 Boiled eggplant. Doraji namul 도라지나물 Boiled Chinese bellflower roots. Bokkeum (볶음) is a dish stir-fried with sauce. Kimchi bokkeum (김치볶음) - Stir-fried kimchi, often with pork (similar to jeyook bokkeum). Jeyook bokkeum (제육볶음) - Stir-fried pork with gochujang (chili pepper paste) sauce and onions. Ojingeochae bokkeum (오징어채볶음) — Stir-fried dried shredded squid seasoned with a mixture of gochujang (chili pepper paste), garlic, and mullyeot (syrup-like condiment). Nakji bokkeum (낙지볶음) - Stir-fried baby octopus in spicy gochujang sauce. Buseot bokkeum (버섯볶음) - Stir-fried mushrooms such as pyogo, oyster mushrooms, pine mushrooms. Jorim is a dish simmered in a seasoned broth. Dubu-jorim (두부조림) — Tofu simmered in diluted soy sauce, a little bit of sesame oil, minced garlic, and chopped green onion. Jang-jorim (장조림) — Beef simmered in soy sauce, optionally with hard-boiled eggs or hard-boiled quail eggs. Jjim is a steamed dish. Gyeran-jjim (계란찜) — Mixed and seasoned eggs steamed in a hot pot. Saengseon jjim (생선찜)- Steamed fish. Jeon denotes a variety of pan-fried, pancake-like dishes. Buchimgae is a near synonym. Pajeon (파전) — Thin pancakes with scallions. Kimchijeon (김치전) — Thin pancakes with old (ripe) Kimchi. Gamjajeon (감자전) — Korean-style potato pancakes. Saengseon-jeon (생선전) — Small portions of fish coated with eggs and pan-fried. Donggeurang ttaeng (동그랑땡) — Patty made with tofu, meat and vegetables, coated with eggs and pan-fried. Danmuji (단무지) — A pickled radish marinated in a natural yellow dye made from gardenia fruit. Japchae (잡채) — A stand-alone dish in its own right, japchae can also be eaten as banchan. Japchae is glass noodles accompanied with a variety of vegetables and beef in a slightly-sweet garlic sauce. Korean-style potato salad (감자 샐러드) with apples and carrots. Samsaek jeon (삼색전), any three different colored jeon are referred to as such. ^ Bhandari, Aparita (22 March 2017). "Learning how to eat banchan". Toronto Star. Retrieved 15 April 2017. ^ a b c d "About Banchan". Hannaone. Archived from the original on 2010-05-18. ^ "Types of Kimchi". Korea Tourism Organization. Archived from the original on 2013-01-05. Retrieved 2013-04-04. ^ 겉절이 (in Korean). Doosan Encyclopedia. Retrieved 2013-04-04. ^ "Korean Food: Seasoned Vegetables". Life in Korea. Retrieved 2013-04-04. ^ "Herbivore's delight – Spring namul". Korea.net (Dél-Koreai hivatalos oldala). 2012-04-10. Archived from the original on 2013-04-30. Retrieved 2013-04-04. ^ "Spinach Side Dish Sigeumchi Namul (시금치나물)". Maangcshi.com. Retrieved 2013-04-04. ^ Sook Choe Ji, Yukiko Moriyama (2003). Quick and Easy Korean Cooking for Everyone. Japan Publications Trading. p. 42. ISBN 9784889961249. ^ 무생채 (in Korean). Doosan Encyclopedia. Retrieved 2013-04-04. ^ 비름나물 고추장무침 (in Korean). Allrecipes.kr. Retrieved 2013-04-04. ^ "Gogumasun namul". Trifood. Retrieved 2013-04-04. ^ a b c "Stir-fried dishes". Life in Korea. Archived from the original on 2013-03-09. Retrieved 2013-04-04. ^ "두부조림(dubu jorim / Braised Pan-Fried Tofu)" (in Korean). Doosan Encyclopedia. Retrieved 2013-04-04. ^ "JANG-JO-RIM". Trifood. Retrieved 2013-04-04. ^ 계란찜 (in Korean). Sports Khan. 2013-03-13. Retrieved 5 April 2013. ^ "Saengseon Jjim Braised Fish With Radish in Seasoned Soy Sauce". The Korea Times. 2010-01-07. Retrieved 2013-04-05. ^ a b c "A List of Korean Savory Pancakes". About.com. Retrieved 2013-04-05. ^ 감자전 (in Korean). Donga. Archived from the original on 2004-02-27. Retrieved 5 April 2013. ^ "Saengseon Jeon (Pan-Grilled Fish With Egg)". Korea Timea. 2009-12-10. Retrieved 2013-04-05. ^ 동그랑땡 (in Korean). Donga Woman. 2006. Retrieved 2013-04-05. 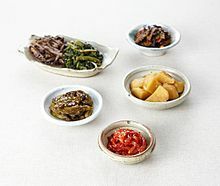 Wikimedia Commons has media related to Banchan. Look up 반찬 in Wiktionary, the free dictionary.